If you've visited this blog in the past couple of months, you have probably remarked upon the notable absence of any sewing. Between vacation, my grandson's surgery, going through three rough weeks of bronchitis, and, now, a discovery that why I am so worn out all the time is that my thyroid is out of whack - well I have not had either the desire or ability to sew much at all. Not that I haven't done anything at all. In early July, I made a top from a Simplicity pattern and I have a matching skirt cut out. I also have a dress cut out, that I had to order more fabric for so I could cut out the sleeves. Well the weather has caught up with me - these are just too summerish for the upcoming fall season. Not that it gets cool here in southern Ohio very quickly, but a cotton mermaid pattern dress just doesn't work in October - unless it is the 31st!! I also have not gotten it together to even start my coat for the Great Coat Sew Along. I was going to bow out, but visited the blog and found that there were many others in the same boat, for a variety of reasons - some have the muslin done, but some have not started. So I am not alone in being behind. I also made another crazy patch quilt, in teal and aqua tones, for my bed. It is king size. I need to find a large enough space to spread the flannel backing and the top out and pin them. No photos of any of these things at this point. So . . . once I get my brain chemistry back into alignment, I will get going on that sewing! Wah - HOOO! My last post about PR was right on - Joe made the grade this week. My prediction is he will now really take off. How about a second win next week?? This year, I'm really hooked on Project Runway. OK, so maybe I have a thing for fellow Midwesterners - but Kelli should not have been kicked off of Project Runway on Wednesday night. Her design was not best executed - I think the leopard and the teal together was too much - but Daniel's nonparticipation did not help her at all. And he made it plain he didn't care. I still think he should have been auf'd not her. My predictions for the top three: Joe, Suede, Kenly. I think Teri is obviously so up tight that she is going to implode. Korto has not so interesting designs. The rest - well maybe Jerrell, but he is pretty inconsistent. I navigated over to Suede's website and saw an interview he did recently. He established some sort of Scholarship at Kent State University (in Ohio). Make me wonder if he didn't have some "extra" funds laying about! I am taking the plunge again. 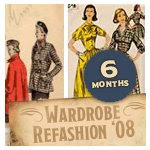 After a two month commitment in March/April, I've decided to go for a SIX MONTH committment to Wardrobe Refashion. This is spurred by a big big closet cleanout. I've got some great things I've loved, but either haven't worn lately, or haven't worn at all. So, starting September 1, watch this space for six months of makings and refashionings! 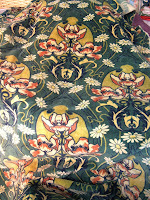 Here are some more of the items I gleaned from the antique and fabric shops of northern Indiana. You never know where you will find something great! 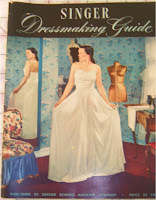 First, I picked up this Singer Dressmaking Guide, copywrited from 1935 to 1947. I hope to gather a number of vintage "tips" from this. 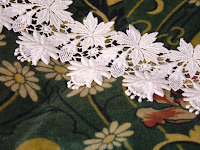 Then, I found six yards of this wonderful lace - I think they are fushias. Both were at an antique mall in South Bend, Indiana. Also at the South Bend antique mall, I found the fabric on the left. It is a heavy upholstry velour. There is about 3/4 of a yard of 60 inch wide fabric. It will make a fabulous bag for winter. 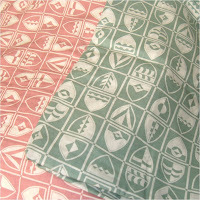 Then the fabrics on the right were a real find. I bought the green rayon to make my husband a shirt - oh a good six to seven years ago. Well Yoder's Department store in Shipshewana, Indiana had the pink on their clearance table - $3,98 a yard. So now we will have coordinating shirts. Also from Yoder's, the black Chevy fabric - picked out by DH of course. This is the first time he has found some fabric he loves - he grabbed the bolt and said he must have it (he he he, the fever spreads!!!!!!!!!!!!). 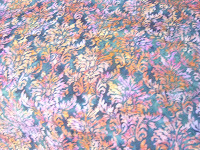 Then I found a great rayon batik for a skirt - it is purple, with brown and gold colors. 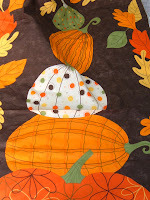 And, finally, I picked up one of the Pumpkins Gone Wild panels to make a quick hanging for the fall. Just love the retro fabrics with this panel. 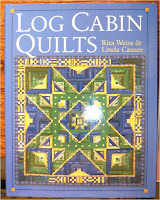 Log Cabin Quilts is a nice book with some different ideas - $8 from a vendor at the Sunday morning Canal Street Market in Chicago. 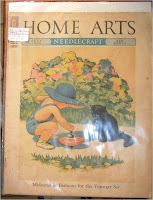 The Silk Ribbon Keepsakes was less than $5, and came from one of the antique malls in Indiana, as did the two Magazines - both from the 1930's at a cost of $4. Combined with the other books I picked up, I should have lots of inspiration for the next year. SHOP - then SHOP some more. Now that things have settled down with Zman, and my subsequent cold, I may have time to show you what I found. 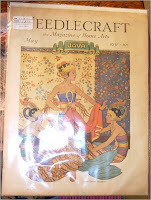 In my wanderings, I ran across a cache of larger size vintage patterns, photos above. They are all 44 to 46 bust size. I love them all, but think I might try the ADVANCE pattern first, (what do you think, mid-1950's??) maybe the Simplicity 7600 next - its dated 1968. I also found the pattern for boys outfits - if you are my age or older, you may remember the young boys outfits where the pants buttoned onto the shirt. I saw a number of these vintage outfits in the antique shops, but was lucky enough to find this pattern in size 3. My guys may have a new outfit for Christmas! 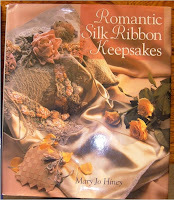 Stay tuned, as I found a lot of other goodied - books, lace, buttons, fabric - all my favorite things.